Whether you’re a DIY enthusiast or a professional decorator, paint brush storage in Aberdeen is top priority.You can raise your game, increase your revenues, save time and money with Brush Mate’s premium quality storage systems. Keeping brushes in good working condition, ready for use at any time is something that all painters worry about. The average cost for a basic set can cost up to anything like £200 and if you take good care of them, they can last for a long time, giving you good return on investment. Brush Mate systems are the ideal way of ensuring that your expensive brushes remain soft, supple and perfectly clean. Our new system is a great product that’s sure to become a part of every decorator or painter’s basic equipment. This brush care solution is just right for use with both water and oil based paints. You can store both types of brushes in the same container, carry it with you to and fro in your vehicle without fear of spills and stains. Traditionally, wet paintbrushes were stored in jars of solvent or water after use. This is not just inconvenient, it’s also messy and ineffective. In Aberdeen, paint brush storage with Brush Mate, allows you to save time and effort spent in trying to clean brushes manually. Just clip them into the container and the unique vapour system allows brushes to become super-clean, soft and dry, ready for the next project. You can also store brushes for any length of time, avoid rusty ferrules and damaged, bent bristles and prolong the life of your brushes. Many painters have a favourite brand or type and sometimes getting an exact replacement is difficult. That’s why Brush Mate is such a perfect system for paintbrush storage in Aberdeen. To find out more information about our paint brush storage system, contact Brush Mate. 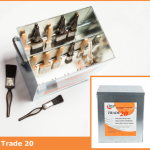 We have two different models: the Trade 20 has a sturdy steel exterior and chunky nylon lid, and is ideal for holding up to 20 brushes. The Trade 4+ is your choice if you’re a DIY enthusiast or you’re undertaking a smaller job. This holds up to 4 large or more smaller brushes.